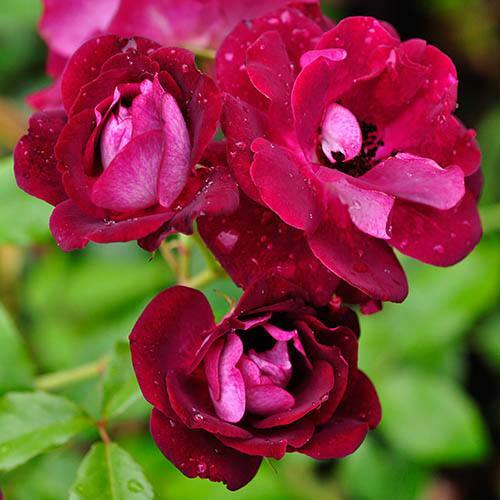 Glorious dark, plum-coloured rose produced in clusters. Lightly scented, rich plum coloured blooms make this a must-have garden rose. Few thorns make rose picking a pleasure - much easier than traditional, thornier roses. Perfect as cut flowers to bring the outside in. Forms a compact, loose shrub around 1m high. Supplied as a freshly potted, British grown, professional-quality plant. A relative of the ever-popular Iceberg, Rosa 'Burgundy Ice' has a similar relaxed habit and medium sized, open centered, semi-double flowers - making it a superb choice for both formal and natural planting schemes. The rich plum-coloured blooms of this floribunda rose are produced in multiple clusters and have a light, sweet scent and contrast wonderfully with the glossy green foliage, combining beautifully with pinks and other dark shades. Growing to around 1m in height, Burgundy Ice carries few thorns on its stems, which makes cutting the roses for your home perfect and a great way to appreciate the flowers for longer. To prune, just remove any dead, dying, damaged and diseased stems and also deadhead regularly. Traditionally, you would cut just above a leaf joint with a sloping cut away from the bud, however, this isn't necessary, and don’t worry about pruning too much - roses are very resilient and will grow back. When pruning, make sure that your secateurs are clean and sharp to prevent squashing stems and introducing disease. Add mycorrhizal fungi to the roots when planting to help the plant establish quicker.